First awarded in 1984, the MTV Video Music Awards (VMAs) are the annual celebration of music videos and artists bestowed by MTV. Over more than 30 years, the VMAs have provided some of MTV’s most talked about moments and they are, relatively speaking, one of the few MTV events that make MTV feel like the old MTV before reality TV (early seasons of The Real World excluded). At the end of August, the 2017 VMAs will take place and they feature a new logo — meant to return year after year instead of being a one-off as previous logos — designed by New York, NY-based OCD and MTV’s in-house team. Previously, the logo changed for each edition of the VMAs. Seeing them all together here is like my youth — up until the mid 1990s — flashing before my eyes and, also, most of them really hurt my eyes. Many of these are really painful to look at as they captured the fads of each year much like some of the artists’ red carpet choices. Usually, the logo was secondary to the on-air graphics which have always been pretty amazing. Starting with 2017, the idea is to have a recurring logo for the VMAs with an annual changing identity around it. OCD worked with the in-house team to develop an identity system that celebrates MTV’s iconic logo and forges a wholly-new, made-to-be-dynamic mark just for the VMAs. The symmetrical structure of the new wordmark allows it to easily transform into countless permutations. In its most reductive form, the mark can be used as a full-bleed pattern or for the framing of content and the housing of imagery. Using the “M” as a window. Being a recurring logo, it had to eschew any overt graphic mannerisms that would date it — all the old logos, by contrast, were timely overt graphic mannerisms — and the concept of building the “V” and “A” from the same shape of MTV’s “M” is super smart and appropriate while yielding a non-conformist logo that goes well with the MTV and VMAs attitude. The extra wide layout of the logo might prove hard to use in some cases but it’s a minor concern for an otherwise excellent solution. 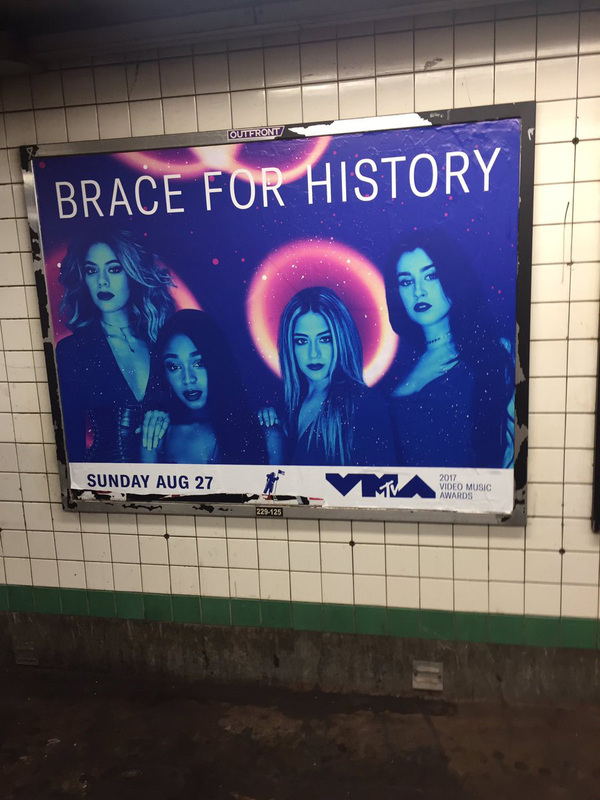 Leading up to the award show, the MTV team mounted an artist-driven campaign that’s out of this world. Across social media and outdoor, the campaign leveraged elements of the identity system to frame content and activate imagery. Video of the Year sequence. Live performances promos (bottom one is silent). The 2017 look and campaign, designed by MTV’s in-house team, is out of this world. Literally. It’s super cheesy — galaxies and stars and constellations and flares and glitter — but also kinda super cool and very well executed. Everything has a great blue and pink hue that ties photos and footage together along with some smooth and groovy motion graphics that put to good use the chosen typeface for the VMA identity, GT America Condensed. Overall, the logo brings some restraint and order to an otherwise chaotic yearly event while the changing look and campaign add the necessary glitz. First awarded in 1984, the MTV Video Music Awards (VMAs) are the annual celebration of music videos and artists bestowed by MTV. Over more than 30 years, the VMAs have provided some of MTV's most talked about moments and they are, relatively speaking, one of the few MTV events that make MTV feel like the old MTV before reality TV (early seasons of The Real World excluded). 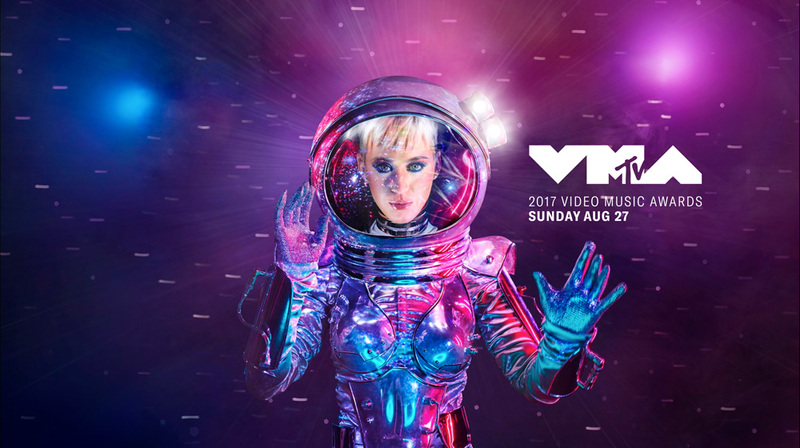 At the end of August, the 2017 VMAs will take place and they feature a new logo -- meant to return year after year instead of being a one-off as previous logos -- designed by New York, NY-based OCD and MTV's in-house team.